Finally late that night I applied the first coat of finish. I use Varathane water-based polyurethane for projects that will have a surface finish. I used to use oil-based surface finishes, but got tired of the headaches and dizziness I would get even when I wore a good canister mask, so I switched to water-based finishes and breathe easier. And so, after more than 12 hours of working, I left my shop and crashed into bed, bone tired, but with a clear head. I tried a lot of different water-based finishes over the years before discovering Varathane. It's by far the best I've found. The quality of the finish becomes apparent over the months and years after it has been applied: it provides a clear, warm, very hard surface that resists damage well. The one drawback to using a water-based finish is that the first coat raises hairs of grain, so you need to sand very thoroughly after the first coat has completely dried. 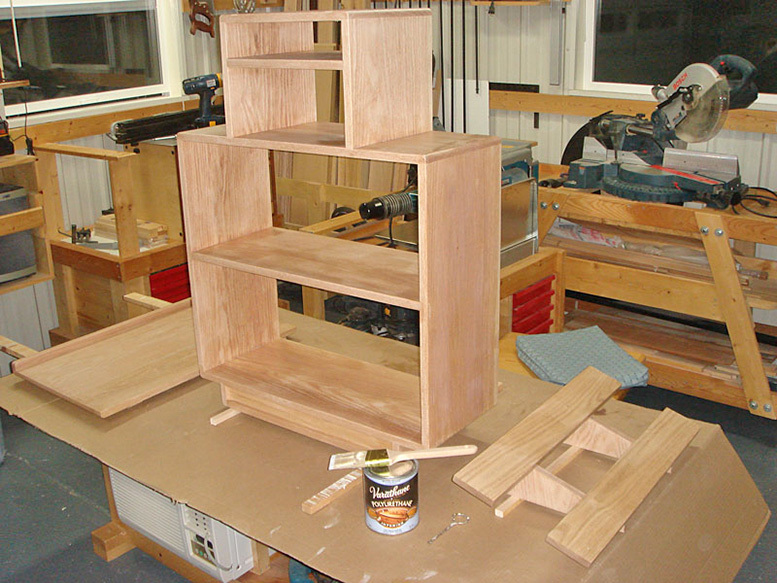 Day four, then, began with a few hours of sanding and applying the second coat of finish. But then I left the shop and, for the first time since I started, headed outside for a wonderful walk along the river. Later in the afternoon I did a final light hand sanding and applied the final coat of finish. It's an incredible feeling to stand back and look after applying the last brush strokes. I use only clear finishes, but even a clear finish enhances and deepens the grain patterns in wood, revealing it's beauty fully. Because I really love the look of maple with a penetrating oil finish, I've used blended Danish Oils—Deftoil, Watco, or Behlen—for penetrating satin sheen finishes, but only when it's warm enough to throw the garage door and windows wide open, and I still wear a canister mask. These give me dizziness and headaches just like the oil-based surface finishes, but there is no water-based alternative. More recently I switched to Tried & True Danish Oil⩘ , which is a pure, moderately polymerized linseed oil that is safer—solvent free with zero VOC⩘ —and easier to use. Tried & True also makes a natural varnish. Because of my good experience with their Danish Oil, I'll probably try their varnish the next time I want a surface finish.